I've found a new Jdrama obsession, which comes as no surprise as you can't just put Yamapi and Ishihara Satomi together in a rom-com and not get great results. My last Jdrama was back over a year ago with Shitsuren Chocolatier, which also starred Satomi. But that drama was less fluff and more odd angst, which thankfully isn't the case here. For those Itazura na Kiss fans, you might also care that the guy who played Naoki is one of the (apparently several) second-leads here. I personally think this is a perfect fit for him, as he never really gave off what I felt was the charisma needed to lead a show, but he does make a pretty picture and is fairly likable. It also makes you realize what a small world the Jdrama acting space is, as fans of Rich Man, Poor Woman may recall he played one of the leading lady's friends in that show (before he hit it big with Itazura). Episode 1 of 5 to 9 was generally quite well-done, with enough cuteness and sparks to get me excited for what's to come. I've read a few chapters of the manga, but very quickly decided it wasn't my cup of tea. I can see why some girls might like it, as the use of an arranged marriage with a monk plot is fairly novel. But honestly, it was a bit shallow and I didn't immediately connect with leading lady Junko Sakuraba, who was painfully self-absorbed. Aesthetically, I also wasn't a fan of the art, which isn't awful but somehow felt empty and soulless. Luckily, neither of these are issues in the drama. You don't get a much better looking couple than Yamapi + Satomi (and holy cow I'm still shocked that Pi is only 30 - it feels like I've been watching him for ages!). They have the chemistry to pull off the coupling, and Satomi is so likable and lovely that she can turn the worst of characters into a sympathetic lead. 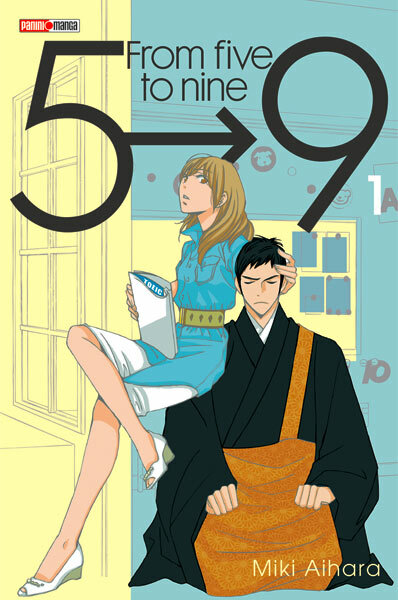 Those who have read the manga will immediately see that the drama has taken some liberties with the story, but is still following the main plot guideposts. (Spoilers ahead). For example, they seem to have cut out the one-night stand but kept the birthday rose rain rescue, which was the main impetus for Sakuraba seeing him in a different light. The drama also totally dramatized the birthday rose gift with a couple hour drive rescue. For me these adjustments work, as this first real encounter in the manga always came across a bit flippant to me. Here, we get to see the sexual tension but have to wait it out, and it's clear that Hoshikawa has taken to Sakuraba as a person rather than for more physical reasons. The one (somewhat big) negative is all the use of English, as Sakuraba works for an English tutoring center and wants to work in New York. The first scene of Yamapi trying to show her up with his English left me cringing and forced me to turn down the volume. It's even more irritating because oftentimes there's no subtitles on those scenes, but it's not like I can really understand what they're saying. Good effort, but embarrassing results here. I haven't read any further in the manga, so am not sure what lies ahead for this couple. But the drama brings back so many of the old-school Jdrama feels that I'm tempted to go back and watch a couple other shows (especially those starring Yamapi - how did he somehow fall so far away in my drama watching)? It's just such a bummer that this show only airs once a week (on Mon), but there was also no way I was going to wait before checking it out. Highly recommend if you even peripherally like Jdramas, and especially if you're a fan of either lead.